Interesting that “fiktion” is part of the German word for “temporary residence permit,” but that’s just the English major in me talking. We returned to the Ausländerbehörden for our follow-up visa meeting yesterday, all five of us, plus our friend the professor who proved so helpful last time. We took the kids out of school early for this; German class, math class and Schülerläden were all skipped in favor of our visa meeting. Our experience this time around was more productive, though consistently inconsistent and in a few ways flawed to the core. Upon arrival we were allowed to step right in to an office across the hall from the scene of our last visit. The last room had three desks and personal photos propped next to computer screens; this room had a wall of glass between applicants and workers. The thick wall rendered the woman’s rapid German utter gibberish to me, made worse by her insistence on keeping her head bowed to the desk as she looked over our paperwork and asked for each item, but she seemed nice enough. M sat in the one chair in the room, an accordion folder bursting with proof of our existence sitting in his lap. Each time she requested an item he would go digging for the right slip of paper, whatever signed, stamped, certified, or notarized document came next, sending social security cards flying and headshots tumbling to the floor. Standing beside him, I could see that his hands were shaking. She asked for M’s letter of work appointment, and he presented none other than the affiliation letter with the local university, though it has no merit at all. Next came his proof of income from his true employer back in the states. After that it was clear I was lumped together with the children; our passports, photos, and proof of health insurance were all that we needed to claim our worth. Only the marriage certificate set me apart from them. No interest in my proof of work and income; no request either for the children’s school bescheinigungen that we’d duly collected from all three school secretaries as proof of their attendance. Once she clipped the relevant information to each of our passports, she dismissed us to a waiting room where we spent the next 45 minutes or so. We were called again to a new room, and this time a young man was seated behind a desk, and with a kind but firm look he asked that just M and the professor stay; the rest of us were sent back in the hall. This was a “trailing spouse” moment as it hit me that I was only there to prove I match my passport photo; it was the husband who was requested to conduct all of the family’s official business. A wound to the pride for sure, but I took the dismissal as the easy pass it was, and led the girls back to the waiting room where the younger two returned to their drawings, the eldest to her texting, and I to my novel. M and our friend emerged from the office about 10 minutes later; he led the way, shaking his head. He’s famous for this, making you think all is lost when really things could not be better. I refused to believe him, smiling, showing him I knew it would all work out fine. But he wouldn’t drop his disheartened look. Well, it doesn’t, but that’s what our paperwork says. It’s an annual contract that is renewed as long as you’re employed, but the date is the date, and the date says it ends in December. “He gave us visas through February 17,” M told me. I raised my eyebrows. We’ll have to return sometime between now and then with a letter showing that our health insurance continues after the end of the year. I see this as a rather minor point. We were granted visas, the thing we came for. We were also given an auto-generated appointment for a date in February we can’t make, because the kids will be off for spring break and we will surely be doing our civic duty and traveling, as all good German families do on school breaks. However, we are welcome to come and take a number and sit in the lobby anytime we please before our visas expire. We fed our 70 Euros into a machine to pay our fee, a sort of reverse ATM, and soon were on our way back to the U-Bahn. We headed to Amrit, an Indian restaurant in our neighborhood, to celebrate our partial victory over paperwork and red tape, and to thank our friend for accompanying us. “Feels like we crossed some sort of threshold today,” I said as we finished off the chicken korma. “But he didn’t,” I reminded him. “I’ll sleep better in February,” he replied, and our friend and I had to suppress smiles. That’s my man. If health insurance is truly the concern, why give us a visa until mid-February, six weeks after our health insurance supposedly ends? Does no one get injured at the beginning of the year? If school attendance is so important, as last week we were told emphatically we must demonstrate, why did you not ask for the school certificates, and when we offered them, why did you take them wanly, glance at them, and return them uncopied? Why did we spend 60 Euros to provide you with biometrische photographs if visas don’t include pictures? What do you do with all our mugshots, us and all the other applicants who pass through your offices? If family solvency is so important, why not ask about the wife’s possible contribution? Isn’t it feasible that the wife is the breadwinner and the husband the trailing spouse? Why assume his work assignment is sufficient to pay for the Berlin apartment that costs more than our mortgage? What if we had presented my work contracts instead of his; would you still have granted us our visas? If a local affiliation with a university is so important, why are you not reading the contract from the employer—the bona fide one—that states in both English and German that no local affiliation will occur? What are you people doing back there while applicants sit in the waiting room and sweat? 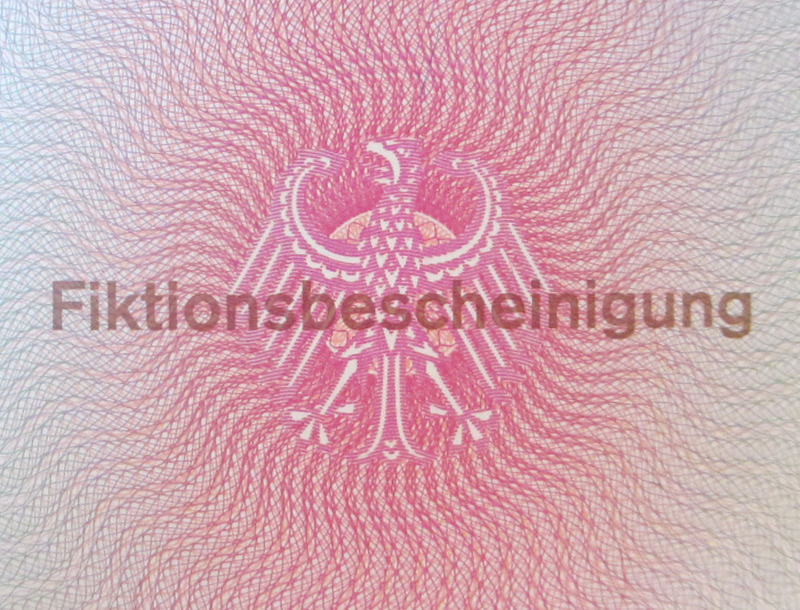 This entry was posted in Bureaucracy, Sabbatical and tagged Ausländerbehörden, Berlin, fiktionsbescheinigung, Germany, health insurance, Schulerladen, temporary residence permit, trailing spouse, wife on October 25, 2013 by Jill M..
UGH. But thanks for sharing, and thank goodness for helpful Germans! Thank goodness indeed. We have a lot to be thankful for. Your blogs continue to entertain me. I look forward to reading them more than I anticipate the daily news…far better! What an adventure…cannot wait for February ! Surely the answer to the last question involves vast quantities of schnitzel and bier – consumed, but not perceptibly enjoyed.